A logo is an identity of any business. Thus, it is important to take special care while designing a logo. It must reflect the business ideology and should be professional. That is why using logo mockups for logo designing is a helpful idea. They just do not provide a designer with a great idea but make the whole process of logo designing simpler. We present to you, a collection of such logo mockups that will make your task easy and interesting. Go ahead and check our collection. With this photorealistic mockup you can make your logo different and give it a professional look. A wall mounted logo has its own significance and with this mock up you can add depth to it. Use Photoshop CS4 or above for editing the filly layered PSD files. By using this fully layered PSD file you can easily edit the 3D mock up files. With the help of smart object, insert your logo and save it and it’s done! For any help you can get support from PDF help file. 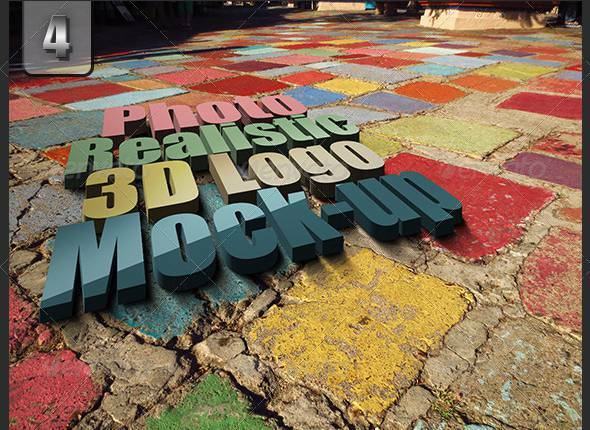 These PSD 3D logo and text effect mockup are for Photoshop CS5 or above. Create your own logo or text with these PSD files and edit them according to your requirement. Smart object layers allow you to insert images or artwork. You can change the depth by Hue and saturation properties. So, be creative. Turn your logo design into photorealistic 3D effect within seconds with this 3D logo mockup. There are a number of PSD files with unique patterns to suit your need. The texture and patterns suits the 3D effect and make your logo eye-catching. No need to mention that this PSD file comes with smart object to edit the images fast. With the help of this 3D logo mock up you can convert simple shape or text into an 3D image quickly. This three dimensional PSD logo helps you to convert your designs into 3D and make them interesting one. The lighting effect allows you to change the logo and make them look elegant in their own way. This PSD file of 3D effect logo mockups has 5 different styles that are fully layered. The files are of high resolution giving you quality output. Smart object allows you to edit the file easily. Just double click on the smart object layer to insert your own artwork and see the magic. There are 5 different mock up template in this PSD file. With the help of smart object feature you can easily turn every logo into an exotic 3D style. You do not have to think about the shadow or perspective as they are auto adjustable. Use Photoshop CS4 or above for working with this mockup file. By using this fully layered PSD file you can change your logo and give them 3D effect in no time. In photorealistic 3D logo mockups, you will get three styles in which you can showcase your logo in 3D. Change the current design easily and use your own artwork within few seconds as it is smart object enabled. If you want any help refer to the PDF help file. You can change the background color, give light effects and do more with your logo. Just be creative and innovative. If you want to give wooden effect to your logo, go ahead and use this 3D wooden logo mockup PSD file. Place your logo and let smart object do the magic for you. Nothing can be more simpler and easier. This is another great PSD file for making realistic 3D logo for your business. Use this multilayered PSD file for designing your own logo in 3D. Your efforts will be rewarded when you design elegant 3D logo with this mock up. This mockup kit features an assortment of big signboard designs. It’s smart objects enable you to create gorgeous logo designs effectively quite fast. It comes with a remarkable blend of photorealistic styles and effects.